I’ve been immersed in a move all weekend, and come back to work to find that a tropical storm named after me is hitting the U.S. today. Check out the National Hurricane Center. More on Bill (the storm) here. Check out radars and cams in New Orleans, Lafayette and Mobile. Here’s a nice hurricane tracker. Many other links are in the right column of the National page. The new WXnation webcam view from north Fort Worth went live around 6 p.m. today. It looks out the window at WXnation’s headquarters, now in north Fort Worth. It’s pointed ENE, and looks at the skies over Keller, Southlake and Dallas-Fort Worth International Airport. Archives of the old Arlington and Fort Worth skyline webcams are still linked below the image. Man-made Clouds Coming; Stormy In Central U.S.
Man-made clouds may come by July 10. We’re off to sign many, many papers for the closing. Entries to the weblog this weekend may be sparse or non-existant. Have a good weekend! Many will see a summery Friday. Details in the forecast story. Storms, tornadoes batter several states while Arizona fire burns 345 buildings so far. More strange clouds tonight for some. Details in Monday’s weblog entry. For others: Record wet spring. Here’s today’s weather forecast story. Check out a new mix featuring Bubb Rubb and Lil Sis — music clip # 8 on this page. More on this phenomenon is in June 5th’s weblog entry. Record Hailstone Hits NE; WXnation Webcam On The Move! Record hailstone lands in Nebraska — six and a half inches wide with a circumference was 17 and three-eighths inches! After exactly 30 weeks, the WXnation.com Webcam from Arlington, TX went offline at 4:20 CT today. It was the only live webcam (besides traffic cams) in Arlington (that we know of), and updated at least once every 30 or 60 seconds 24/7 since Nov. 27, 2002. 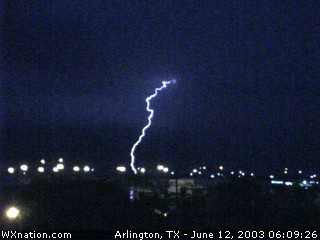 Many, many great captures are broken down by month at the webcam archive page, which includes a great lightning strike shot. The webcam moves to WXnation’s new home in north Fort Worth in about a week. Look for a new view pointed to the northeast … toward Keller, TX and north of DFW International Airport. SpaceWeather.com says strange clouds will be seen on the Eastern Seaboard Tuesday night. More details from NASA. Earthquake rocks ocean south of Aleutians. Here’s a nice earthquake activity map. Much more in the National page. Summer is here! Was Saturday a long day for you? Maybe because it’s the longest day of the year! It was a long one for me: My wife and I went to a $50,000 giveaway at a storage place in Keller, TX. Didn’t win anything, so we went out searching for a good bedroom set, spoke to our homebuilder (we’re days away from closing on our house), and caught the Texas Rangers/Houston Astros game. The Rangers played poorly until we left at the end of 7, and then they hit 2 homers. They still lost, but maybe me seeing them is a jinx… Naah, they just need pitching! Here comes the heat in North Texas. On a website note, I removed the voting from the Super Sites page. The votes in the Top Cams page run from Nov. 2002 to June 2003. They are accurate, but were getting to time consuming to maintain, plus the removal of the “Vote” buttons on the Super Sites page reduces its download time considerably. Well, my wife and I had a nearly 3-hour walk-through of our new home today. Plenty to sign and plenty of questions… Overall, things look good. We move in by the end of the month. 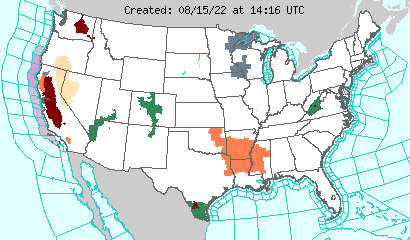 Drier weather for Ohio Valley and the parts of the South. Friday’s weather story here. Getting close to Mars! Here’s a star map for Thursday morning. And more from Britain: New webcam in U.K. excites some, to others it’s a plain train.